Show off your team pride in this Kansas Jayhawks Blue Home Base Long Sleeve T Shirt! 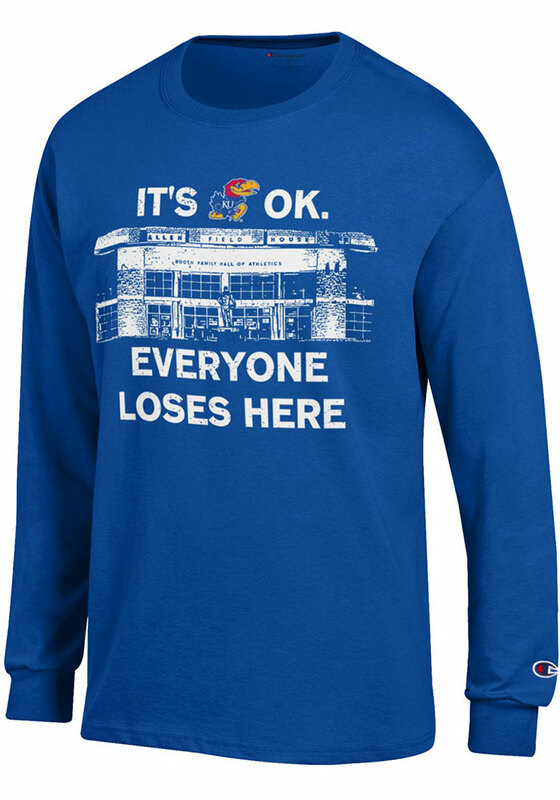 This KU Jayhawks Long Sleeve Tee features a screen printed Allen Fieldhouse graphic with the wordmark "It's OK Everyone Loses Here" and Jayhawk logo on chest. Make sure everyone knows you root for the Jayhawks with this Blue KU Jayhawks T Shirt. Rock Chalk Jayhawk! I am a HUGE star wars fan so naturally i had to buy this shirt. It is extremely comfortable and I get sooo many compliments on it whenever I am out and about ! Go Irish or Go Home! Ready to rock my Irish Pride!! Great shirt! This is a great shirt but unfortunately the threads are already coming apart on the cuffs after just two washes. It really should be able to handle more than that. Ordered this online using the ship to store option and I was pleased with how well that went. Too bad the shirt isn't as good as the service I got.